Bridget Welsh is Associate Professor at John Cabot University, a Senior Research Associate at NTU, a Senior Associate Fellow THC and a University Fellow of CDU. She analyzes Southeast Asian politics, especially Malaysia, Myanmar, Singapore and Indonesia. She is committed to engagement, fostering mutual understanding and empowerment. Comprising nearly 40 percent of the 14.9 million electorate, Malaysia’s youth (those under the age of 35) will be decisive in shaping the outcome of GE14. It is fitting that in this crossroads election about Malaysia’s democracy, the young will choose the path ahead. The problem is that for many of Malaysia’s millennials (born in the 1980s) and Generation Z (born after the mid-1990s), none of the political parties are adequately capturing their aspirations for the future. Disillusion, disengagement and growing indifference have been winning as the youthful enthusiasm present in GE13 is noticeably absent in this election. Those that do come out (or come home) will be crucial in determining the outcome of close races. The youth vote will be especially important in Johor, Kedah, Kelantan and Terengganu, and given their numbers they hold the results of the national election in their hands. Today’s youth understandably engage politics differently than their seniors. Most have come of voting age after the 2008 election, so having a prominent opposition is “normal”. Their views of the opposition, however, are less sanguine compared to earlier generations. The discord within the opposition and failures of the Kajang move which led to the breakup of Pakatan Rakyat, for example, have undercut their confidence in the opposition leadership. 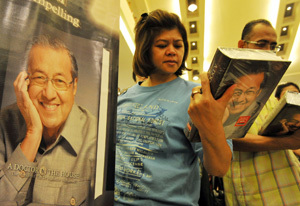 Dr Mahathir Mohamad’s leadership has brought more stability and focus to Pakatan, but this is only a relatively recent phenomenon that has yet to fully connect with many younger voters. Mahathir himself – at 92 – is not someone they know, as they did not live through his leadership. What they know has been shaped by the socialisation of their families and education. One of the many ironies of this election is that it is the BN government which taught many of the young people positive views of Mahathir’s leadership. His memoirs A Doctor in the House was part of the curriculum. It is equally ironic that it is the BN government that is working hard to destroy this image. Those youth who are engaged are keenly watching Mahathir, as they are getting a chance to assess for themselves who he is. Yet, among many, there is a disconnect with a man who is seen to be about the past and whose role in the future is unclear. For most politically active youth, it is the recent past that is more impactful. GE13 was deeply traumatic, leaving a sense of hopelessness and helplessness. Many invested in change and it did not materialise. This was a formative event, leading many to disengage from politics altogether. Recent surveys by the Merdeka Center and Watan show that a whopping 75 percent of youth are ‘not interested in politics’. The clamping down of political discussions and space at universities has been a contributing factor as well. Pakatan Harapan is grappling with how to bring them back, to reinvest in politics, and having mixed results. The disengagement of Malaysia’s youth is most obvious in the voter registration numbers. Of the 3.8 million voters who have not registered, the overwhelming majority of these are younger voters. They see little purpose to be part of partisan politics. They would rather follow their sports teams, ride their motorcycles, spend time with family or go about their jobs than participate in an alienating and distant political contest. Today’s young engage in politics very differently from their seniors as well. As digital natives, their main source of information is through social media and the Internet. Here the BN’s dominance of cyberspace, buttressed by its resource-funded bots, chatter-bots and trolls, work to its advantage. Yet, for many youths (and frankly, many more seniors), the challenge is to distil the information, as they are bombarded by conflicting messages. Surveys report that as many as 70 percent of youth are “confused”. They know about the 1MDB corruption scandal, but at the same time are hearing a cacophony of negative views about the opposition. Trust in political leaders and institutions across the political divide is especially lacking among youth. Their main concerns are with the present and economic in nature. High prices, cost of living, jobs and employment opportunities, paying for education, weddings and a night out with friends are the immediate focus. At the same time, Malaysia’s youth are more travelled, more global in outlook and many have adopted the post-modern values of concerns with the environment and sustainability. Don’t be fooled by their age, as the youth of today show a maturity of outlook that is deeper than many of their seniors, combining idealism, pragmatism and cynicism. The political parties have adopted three different approaches to engage youth. TBN with its National Transformation 50 (TN50) has done the most work investing in the youth vote. Led by Khairy Jamaluddin, the initiative carried out extensive engagement with young Malaysia’s about the future, reaching out reportedly to over a million stakeholders, with at least 60,000 different suggestions. The 492-page document lays out a broad (and substantive) plan for Malaysia from 2021 through 2050, and many of these suggestions were incorporated in the BN’s youth manifesto, one of the many sets of election promises launched last month. Youth programmes have also been incorporated into the BN state manifestos as well. The dominant paradigm of the BN towards youth is focused on opportunities, with an emphasis on entrepreneurship, training and jobs. This is buttressed by promises of improved facilities for sports and education. What is noticeably de-emphasised is political representation, although there is mention of creating a Youth Council at the national level. This speaks, however, to the lack of youth representation in current political institutions. The youth promises this election are less populist in nature compared to GE13 which relied heavily on financial handouts for handphones and through the Bantuan Rakyat 1 Malaysia (BR1M). This time there are more measured and targeted financial inducements, with promises of funding to support weddings and transportation in the TN150 transport pass, for example. Kedah is one of the few places that actually lists the financial amount, promising RM238 million for a new football stadium, coaches and local grassroots sports activities. The dominant view is that youth are concerned with what they can get from the government, with the message sent that the BN is the “safe” and secure vote for their future. For Harapan, the primary mode is to harness anger towards the government. A good example is their call for loan relief for students blacklisted by the National Higher Education Fund Cooperation (Perbadanan Tabung Pendidikan Tinggi Nasional or PTPTN). While Harapan does offer its own set of promises – namely free university education (in public universities) and more affordable housing – the main assumption is that youth resentments – about the economy, corruption, unfairness, inequality, contracting democracy and lack of opportunities – should be mobilised. This comes from the long-standing assumption that the youth traditionally are against the government. 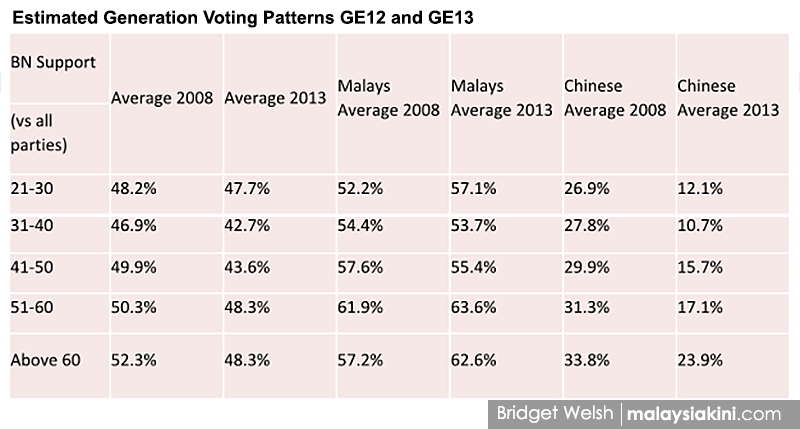 Voting patterns in GE13 did show this pattern as well, noted in the table below, but also point to variations among youth. It is not clear how much anger is motivating the youth this time around. GE13 differed in that its campaign also contained hope for change. Harapan has its work cut out to bring back a positive message among youth, although the momentum in the campaign so far shows some promise in this regard, as their campaign has increasingly focused on a potential national victory, a change of government. 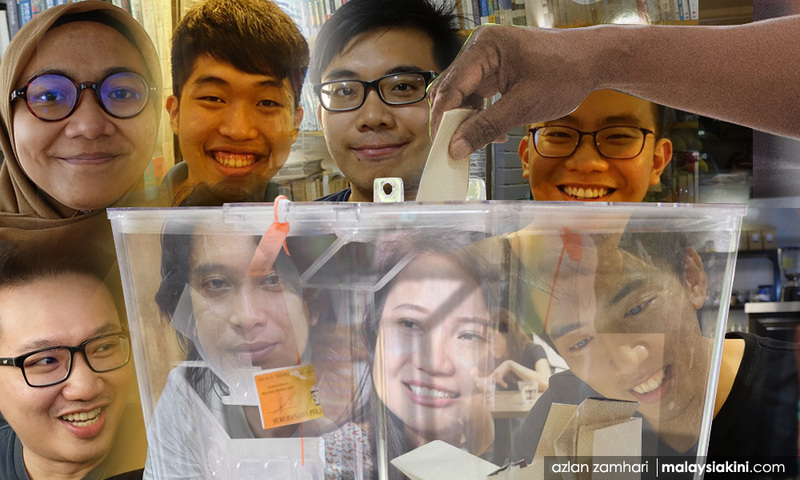 Harapan fortunes are banking on the hope that youth will take a risk and vote for them. For PAS, they have an altogether different approach. Their focus is on religion, and they take their optimism about youth support for their party from surveys showing growing conservatism among young Malay/ Muslims. A higher number of Malay youth do support syariah law, for example, compared to more senior generations. This has reinforced PAS’ rationale to call for stricter and more conservative syariah law. For the PAS core, this is a call for Muslim empowerment, in which the young play an important role in achieving a religious agenda. PAS, however, does not only focus on conceived Muslim empowerment, it also taps into resentment in a different way – perceived attacks on Islam and Muslims. They are tapping into this anger, which is real among many Muslims who see the faith as being maligned and disrespected. This explains PAS’ increasingly racist and exclusive (anti-non-Muslim) tone to their campaign. Many of its leaders have openly joined in on the demonisation of non-Muslims, especially of DAP. Their messaging is being quietly but purposefully delivered in mosques, religious schools and communities across the Malay heartland. PAS is relying on youth support to keep the party in the national political game. These different modes – opportunities/security, anger/hope and religious empowerment/resentment – speak to the variation in how different political parties perceive youth. They also speak to different visions of the future, contrasting the “secure” status quo with promised goodies and opportunities with that of promises of new social contracts with either greater democracy/fairness/better governance or a more religiously conservative polity. Estimates of generation voting patterns from the previous elections (drawn from a study of the streams in different polling stations) show considerable difference across age and race. 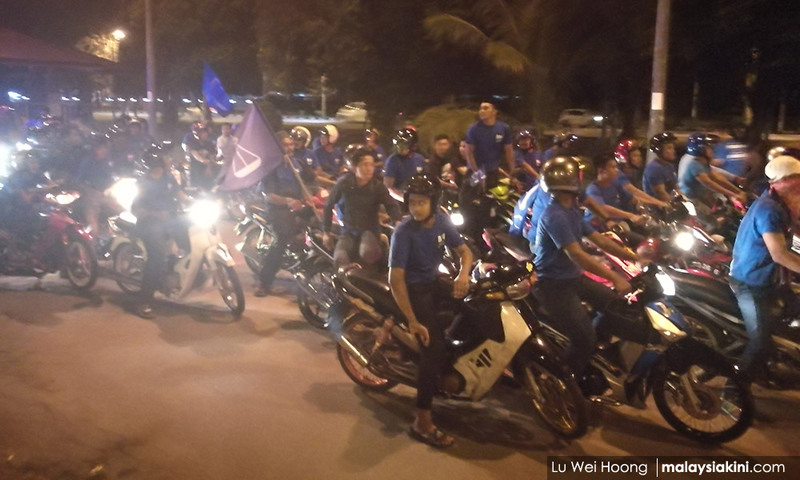 For Harapan, the important issue is whether it will maintain the support of Chinese youth and cut into BN’s dominance of Malay youth support (particularly having lost PAS support). For BN it will be whether their hard work in engagement can maintain its support levels or whether resentments over the economy will erode its support further. For PAS, their assumptions about youth speak to the viability of their message both for short and long-term for Malaysia and will determine whether they will continue to openly adopt a conservative and exclusivist approach. The youth vote is likely to remain as divided as other generations in this election and given the signs so far, not likely to experience the same swing as it did in GE13. All the campaigns have fielded more younger candidates to woo support and continue to speak on youth issues. Young Malaysians are filtering through these different appeals. Youth turnout will be the factor to watch. Key will be how many youths actually turn out to vote and choose to take control of their future. Embedded here, of course, is which of the futures they will choose. None of the appeals showcase the breadth of vision and aspirations young Malaysians deserve but all offer a different approach to empowerment and risk. No question, the youth will be the ones that will have to live with the effects of the 2018 electoral outcome the longest. It is not just about the winners, their messages and political engagement in the campaign but the direction the country will follow well beyond GE14.